Saloon girls kept the men happy and at the bar. It’s no secret that Queen Victoria’s habits and manners influenced a generation. So much so that we call it the Victorian Age. From clothing to wedding traditions, she touched more than England. The eastern states were equally affected. But the Wild West? That was another matter. To the westward pioneer, a great deal of these Victorian practices were just not practical and were quickly dropped. Consequently, the west took on a shape of its own. Rowdy frontier towns gave rise to rowdy frontier saloons which in turn gave us the saloon girl. I’ll be honest and tell you that I stumbled across this topic a little on accident. I was working on a story idea to submit to my publisher and wanted to make sure the term I was using to describe my character was correct. I’d used the term “saloon girl,” but was thinking more of a Gunsmoke-Miss Kitty type. What I found was that there was a great deal of difference between the saloon girl and the prostitute of the Old West. The saloon girl had many different names. The 49ers in California called them “ladies of the line” or “sporting women.” Cowboys called them “soiled doves.” Kansas trailers knew them by many names, "daughters of sin,” "fallen frails,” "doves of the roost,” and "nymphs du prairie.” Still others referred to the saloon girls as "scarlet ladies,” fallen angels,” "frail sisters,” "fair belles,” and "painted cats,” to name a few. But they were all the same: saloon girls. Now, east of the Mississippi River, women didn’t go in saloons, but the west was different. To the “proper” woman, there were two kinds of improper ones: saloon girls and prostitutes. And to this “proper” miss, these were lumped together and considered a necessary evil. But to saloon girls, what they did was vastly different than the prostitutes. Only in the roughest of saloons were the ‘’girls” and prostitutes one and the same. Otherwise, saloon girls held themselves higher than the prostitutes and wouldn’t be caught dead associating with one. So what exactly was a saloon girl? They were workers, hired by the saloon to entertain the lonely men. And men in the West tended to be lonely. They outnumbered the women three to one in most places. In California in the mid-1800s, the population was ninety percent male! The saloon girls’ job was to dance with the men. They sang to them, talked to them, and otherwise kept them in the saloon buying drinks and playing games. Most of the girls had come west from farms and mills seeking a better life, the opportunities that the West had to offer. A great deal of them were widows who, without a husband to support them, had to work for a living. Unfortunately, the Victorian Age didn’t offer a great deal of employment opportunities for women. In fact, the men of culture acted like women were brainless. The only legitimate opportunities for a woman’s employment were cooking, cleaning, or washing clothes, all backbreaking work. That’s not to say that being a saloon girl was easy. A high probability of a violent death was a certain job hazard. Most of the ladies carried small pistols or daggers to protect themselves from overzealous patrons. The girls were encouraged to dance with the men, then get the men to buy them drinks. The men would pay regular price for the ladies’ drinks though the women would secretly be served cold tea or colored water. (A practice my deputy husband tells me is still in use today. Who knew?) The girls got a commission off the drinks and a set salary for the week. They were also discouraged from spending too much time with one patron as the saloon owners lost a lot of employees to marriage. As I mentioned, the saloon girls were there to dance with the men. Dancing usually started at eight or so in the evening. Each "turn” lasted about fifteen minutes and a popular girl could average as many as fifty dances a night. Often times they could make more a night than a working man could make in a month. Because of this, it was rare for them to double as a prostitute. In fact, many ladies of ill repute found they could make more money as a dance hall girl. Most saloon girls were considered "good" women by the men. And in most places the women were treated as "ladies.” True, Western men tended to hold all women in high regard, but the saloon girls and/or the saloon keeper demanded the respect. Any man who mistreated one of these women was quickly deemed an outcast. If he insulted one, he would most likely be shot and killed. I think we’ve all seen the picture of a dance hall girl, with her brightly-colored, ruffled dress ending at her knees (scandalous!) and her painted face. 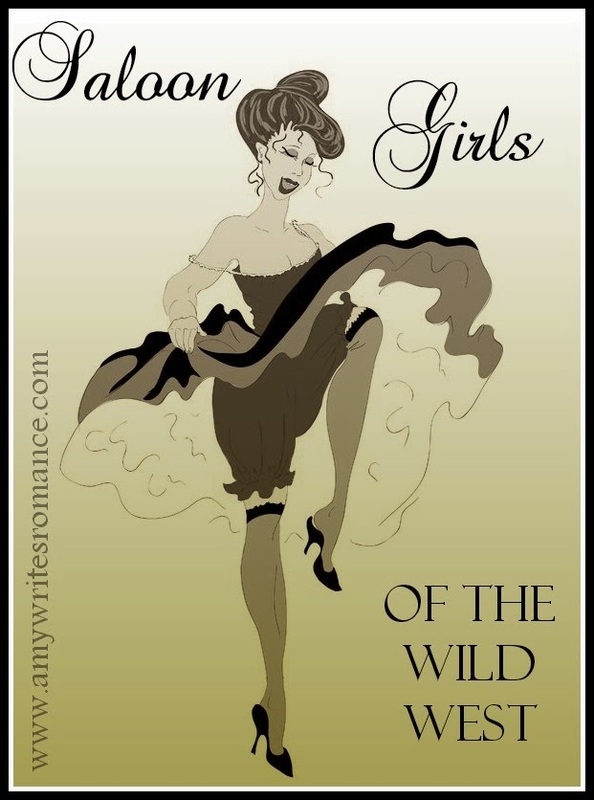 Yet with as many westerns as I watched with my dad as I was growing up, I never picked up on the distinction between dance hall girls and ladies of the night. So what say you? Miss Kitty…saloon girl or not? What an interesting post, Amy. I wasn't aware of the distinction between saloon girls and prostitutes. It makes sense now that you've got me thinking about it. A group of woman working the crowd would be able to make a lot more money than a handful of soiled doves secreted in the saloon's upstairs rooms. My husband and I have been watching the Gunsmoke series lately, and I have wondered many times about the way they portray Miss Kitty. According to your article, she would have been a saloon girl. She also could have made enough money to be part buyer of the saloon like they portray in the show. I'm really enjoying these history posts! Even though many of them made good money, it sure was a rough life. And then they were often looked down on by the "good" people of town, as you mentioned. Thanks for the interesting post! I did know the difference between saloon girl and soiled dove, but only because of the research I had to do for Waiting for Morning. My heroine was a former saloon girl. Had I read your post before I wrote the book it would have saved me a lot of time. :) As for Miss Kitty...actually in the early shows she was very definitely a prostitute. I remember seeing her emerge from the second floor with the marshal. However, she was toned down in later episodes and became more of a businesswoman or saloon girl. Margaret, you got it right. Gunsmoke was a radio program before it went to TV. Miss Kitty was very definitely, though also subtly a prostitute. It was after the first season that they made her more of a business woman. In fact, she was part owner of the Longbranch. Thanks everyone! Great post, Amy. I was vaguely aware of the difference, but never really researched it to know the depth of the difference. I had a character once who forced his daughter into prostitution at the saloon and made a deal with the owner for part of her earnings. All the different terms are really interesting. Putting those down for future reference. Thanks. I'm just now getting around to reading this. What an interesting post! I'm like Martha -- vaguely aware, but really hadn't made the distinction. Love learning all these tidbits of history! I too will pay more attention to western movies now. Thank you for this very informative post! Although it is not my usual genre, I decided to try my hand at a western type story, and I was also trying to get ideas for a name for a "Miss Kitty" type character, and found your post. In all the years I have watched "Gunsmoke", I wasn't aware of the difference either between the "soiled doves" and the "saloon girls". Thanks again! I would love to know if anyone knows the name of the dresses the saloon girls used to wear. The fancy ones. If they had a name. Miss Kitty was a Madam but her identity was kept secret because of television. Miss Kitty was a Madam, but her identify was kept secret because of television. The facts can be found by researching the Gun Smoke radio show. Thanks for this enlightening post, re: dance-hall girls, I am a long time history buff.